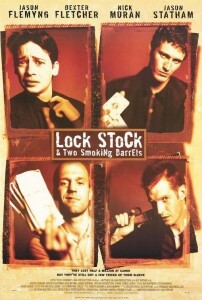 Lock, Stock and Two Smoking Barrels sparked a short lived spate of samish wannabes of vast ensemble casts spouting salty dialogue in unique circumstances, much of it from director Guy Ritchie himself. But you can’t go past Lock, Stock as the originator and best example of the genre. More than a decade on it remains fresh, smart and entertaining, launching the B careers of both Vinnie Jones and Jason Statham. Ritchie proves that he has an ear for dialogue and a well chosen musical interlude, and the ability to fashion a labyrinthine multi-layered plot populated by colourful characters all entrenched in the small time underworld. The core plot follows 4 long time friends, Tom, Soap, Eddie and Bacon, all toeing the fine line between a (mostly) legal existence and petty crime. These four are hardly hardened, hardmen at the start of the film. But things change when circumstances demand. To be more specific, when a high stakes poker game with renowned underworld figure Hatchet harry goes awry and Tom and buds find Harry on his tail and his Dad’s (Sting) bar on the line, with seven days to make good on a half million pound debt and no obvious legal way to fund it. A myriad of colourful characters quickly and often unwittingly become embroiled in an ever-escalating, increasingly intricate, always irreverent series of events. Drug dealers, hired goons, thieves and more than enough hard guys than would usually be required to change a lightbulb all descend upon the four in ways that are circuitous, coincidental and convenient. The body count grows steadily, though for a long while most of the violence occurs offscreen, but as the stakes are raised and the number of participants grows it is inevitable that so many guys waving guns about will eventually bring casualties, many of which fall in quick succession. 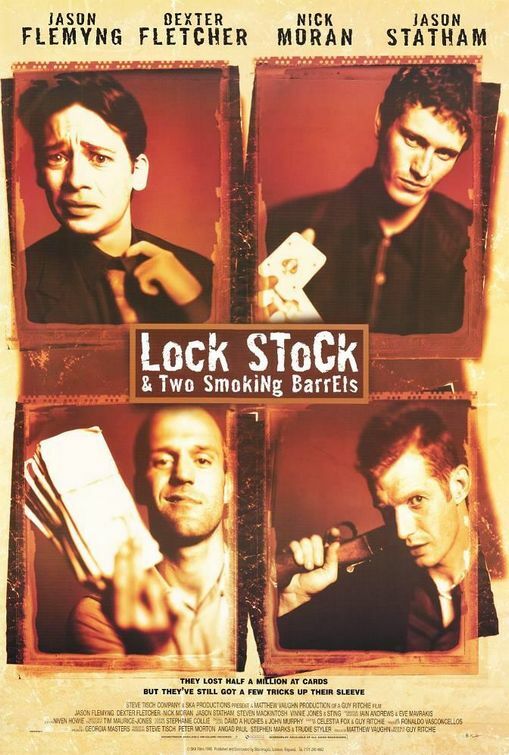 Despite this Lock, Stock is hardly a ‘video nasty’ akin to Hostel and the Saw films, but a wildly entertaining and creative Cops n Robbers tale sans the Cops that shows good plotting and well crafted dialogue can elevate a film above the pack. This entry was posted in Film, Jason Statham, Movie Reviews, OGR Recommends, Superstars, Worthwhile Movies. Bookmark the permalink.